A few dog parents have situations wherein they restrict their dog's social life. Reasons like, infection, harmful behavior, fractured leg, etc. restrict social life. Owning pet strollers for dogs helps the dog and the owner during this time. A stroller will help you to take your pup or your sick dog to a nature walk. If you want to buy a stroller and looking for pointers on how to proceed, worry not. We have done the hard work of reviewing the best strollers and have come up with top 5 picks. Before we jump to our list of top picks, we will understand the types of strollers available. With design perfect for small size dogs, these strollers are best suitable for breeds like Chihuahua, pugs, Bichon Frise, Bolognese, Daschund, Maltese, etc. These are the ones best suitable for breeds like Bulldog, Siberian Husky, Whippet, Boxer, German shepherd, Rottweilers, etc. Large dogs require a big stroller which can host breeds like Basset hounds, Akita, Alaskan Malamute Etc. Big dog strollers is another name used to refer to these strollers. As the name suggests, it can house two dogs at a time and best suitable for pet parents with more than one dog. These are the strollers with suitably designed runners for parents who like to run with their dogs. They are ergonomically well built, and the dog inside this stroller will not feel any of the rough road patches with speed. Knowing your dog breed and size will help you to a great extent to choose the right stroller without any hustle. There are many cheap dog strollers which promise a lot of comforts. In the end, you will end up wasting out more cash with cheap ones. To make sure not to waste money on strollers, we did a thorough examination and trials before coming up with the list. We looked into many pet strollers suitable for dogs to recognize its comfort and user-friendly features. Build quality and undercarriage area for storing any on the go items. Thus a lot more highlights to ensure you get the best choice for your lovely pooch. Now, without any delay, we will right away skip to our top picks. The Promenade pet stroller is one of our picks that passed the tests. The stroller comes with, 3 wheels, a good resting area suitable for small and medium dog breeds. Multiple storage areas with zippers allow you to store the items you want to carry. Mesh windows on front and back help your pet to have a great view. The brakes and wheel quality is excellent; we loved to use this. This stroller is easy to set up and fold too. The canopy spreading will never hamper the available place for the pet. It is one of the best dog strollers for hiking. Priced at a reasonable rate, this is one of the best picks we vouch for. This stroller hits the list for the amazing features it boasts. With 4 wheels, it gives proper stability, and there is no way the pet can feel uncomfortable. Stroller with right balance makes it a good dog running stroller. 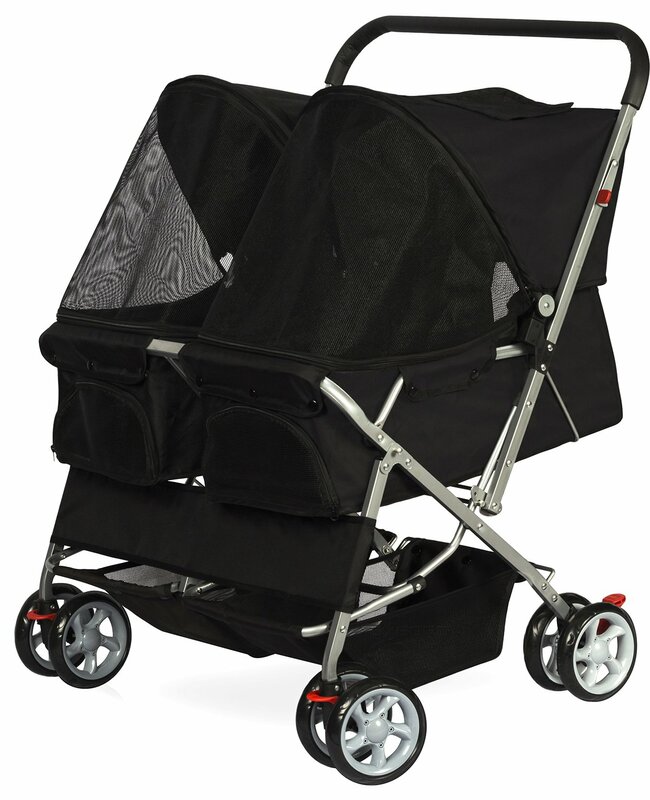 The stroller comes with detachable open undercarriage basket which is easy to clean and replace. Mesh ventilation provides excellent airflow and view for your dog. The shock absorbers in front wheels and brakes at the back helps you to control the stroller movement easily. With canopy in full swung mode, the pets can enjoy good space. 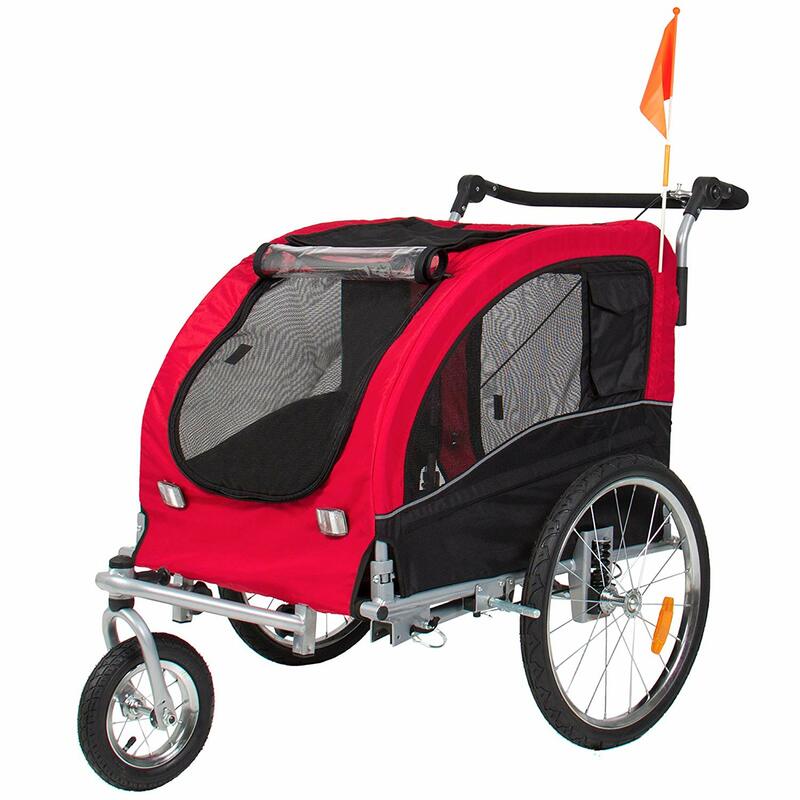 The 4 wheels make this one of the best dog strollers for jogging with proper balance at high speed. It is suitable for small dogs up to 30 lbs. 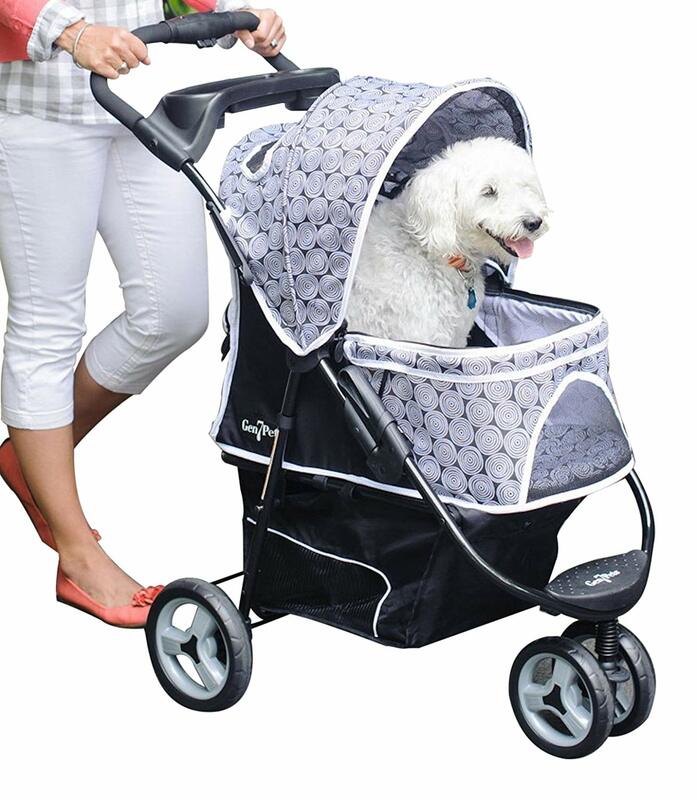 It is a fantastic low-level stroller for dogs of medium to large size. They do not come with any storage area other than 2 pockets at the back. 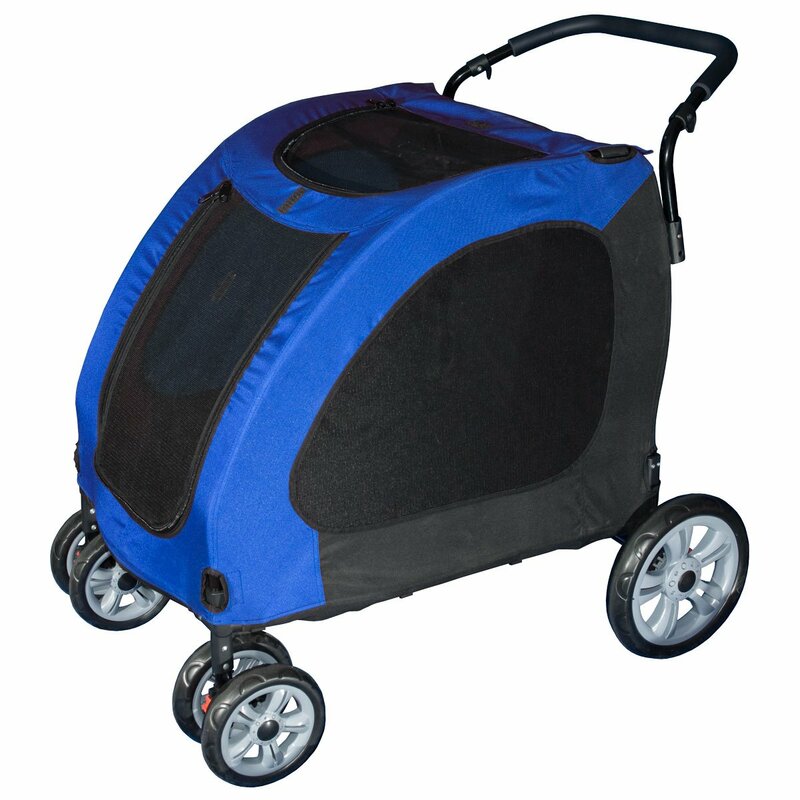 Proper wheel balance and large rest area with front mesh are perfect for dogs. 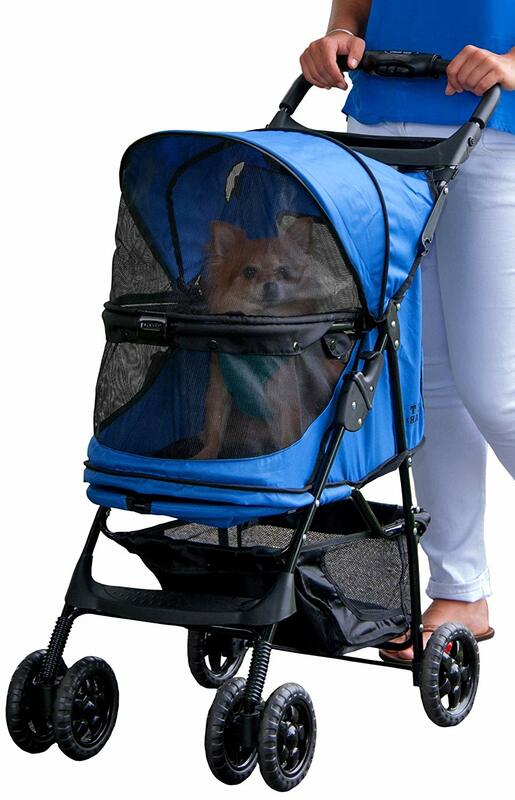 Stroller provides 2 openings, top and front, which allows the dog to have a comfortable entry and exit. Mesh areas on 3 sides will enable the pet to have a complete view with proper ventilation. 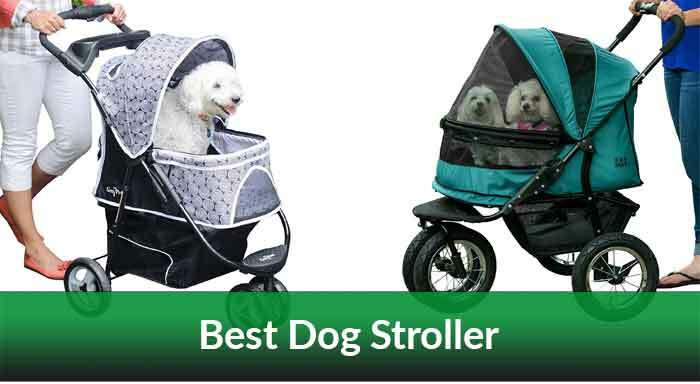 This stroller is our pick for those who have multiple dogs. The stroller has 2 separate resting space with a separator. Each of the space can hold a large breed dog and has mesh material covering in the front and sides. It gives proper ventilation and views to the dogs with their own comfortable place. The stroller also has many storage areas with cup holders and zippered pouches in the front which helps you store as many items which you may require on the go. Premium wheel quality and right balance make it easy to maneuver the stroller though it seems bulky to look at. The metal structure is well built to hold the weight of 2 dogs, and the stroller can be collapsed easily. It is the best dog stroller for bikes. Anyone who wishes to take their dog out, while on a bicycle ride, need not look any further. This one suits their purpose well. Proper mini bicycle wheels and a pulling handle that can be attached to any vehicle make it easy for the users to take the beloved dogs to their cycling route. Properly built and wheel balance in place, the user need not worry about tripping while cycling. The stroller has a huge area which is suitable for all large breeds. It comes with a sturdy metal structure which speaks about the quality. The material used is waterproof and has a decent storage area. The air for tires can be filled with bicycle pumps and are low maintenance. The stroller also comes with safety reflectors and good suspension. With each of the above stroller serving different purposes, we wish to pick a stroller which can be helpful in every condition. Our staff pick is Best-Choice-Products-Stroller-Suspension. It is a multipurpose stroller while you can use it as a regular hand pulled stroller, you can use it for biking and hiking also. With maximum space available for dogs inside this give more comfort and happy sightseeing. It also comes with a removable cushion inside which makes it more customizable. However, the other top picks serve equally best to different needs as mentioned in our article.